Get the No. 1 employee engagement survey and all the strategic advice that goes with it. 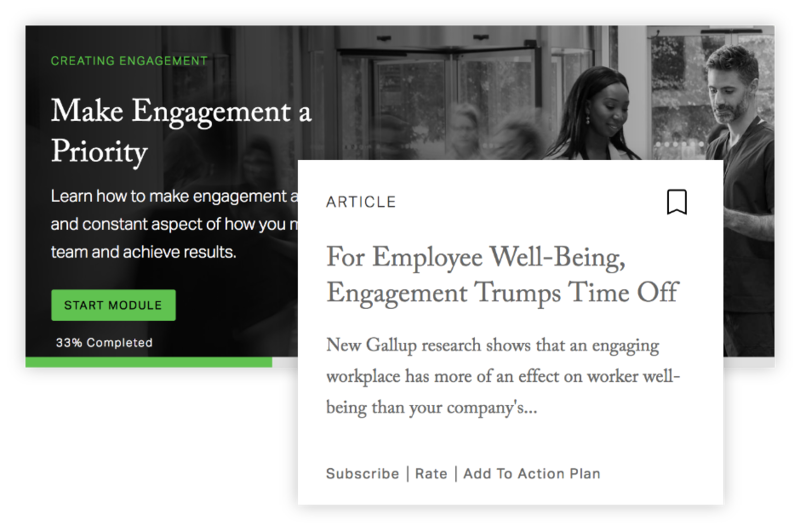 Gallup's Q12 employee engagement survey and resources are the most effective way to create a stronger, more engaged workplace. But it's the one that works. Gallup has studied millions of managers and organizations worldwide. And we've discovered what the best do to build engaged workplaces. We discovered there are 12 employee needs that, when met, improve your organization's productivity. These 12 needs make up the questions on Gallup's famous Q12 survey. Why ask your employees hundreds of questions when you can get the most accurate results and action ideas by asking only 12? Employee engagement doesn't stop at a survey with Gallup Access. We know employee engagement is effective only when it's part of your organization's culture and business strategy. That's why our platform sets managers up for success with learning and advice they can access every day to develop targeted conversations with their teams. What makes Gallup's Q12 survey the best? You don't have to ask a lot of questions. Just the right ones. Gallup's 12 items accurately measure what matters most to your employees and your business. You won't just get numbers. You'll get the meaning behind those numbers and the advice you need to act fast. Gallup's Q12 survey results tie directly to outcomes such as productivity, profitability, and employee retention and turnover. Find out more in our State of the Global Workplace report. We aren't new to the science of employee engagement. In fact, we helped launch it. We've spent decades studying what matters most to employees and teams, meaning you have 35 million people (and counting) to compare your results to. Easily identify areas of strength and opportunity, and then take action. An engaged workplace is only 12 questions away. Request a demo today. Fill out your information to have a Gallup representative contact you via email or phone within 24 hours.